Yes, it was rather a last minute thing but happily we did manage to get table tonight. A lovely way to start the evening. 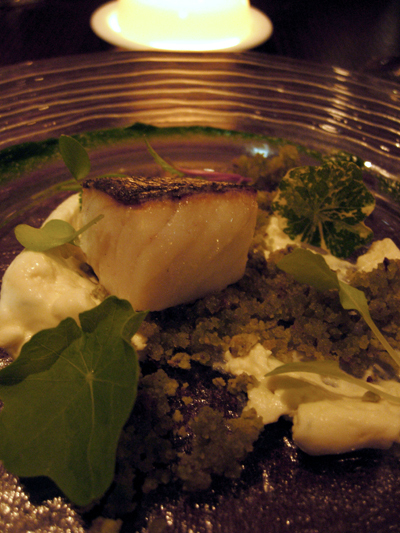 We have the salted blue eye cod on a celeriac and salt cod puree, with nasturtium puree and two types of smashed pistachio crumbs. 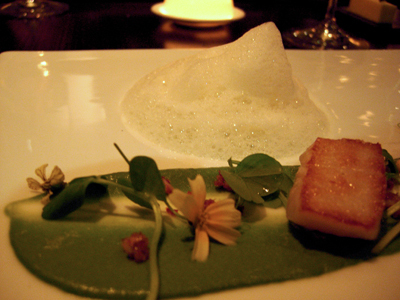 Large seared pieces of scallop sit on a deep green leak puree (made just with the green part of the leek - I am amazed by the depth of colour). There's a sprinkle of bacon crumble which are tiny pieces of ultra crisp bacon. 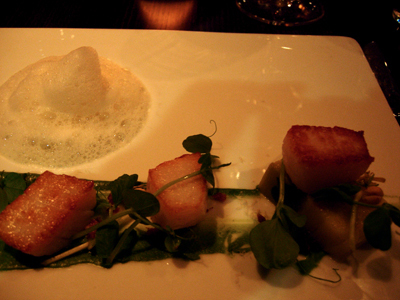 The scallop on the far right sits atop a leek terrine that is made just from the white part of the leek. 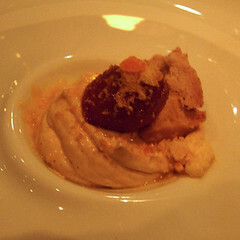 The Hazelnut foam sits in a depression on the plate and carries an intense flavour of hazelnut. 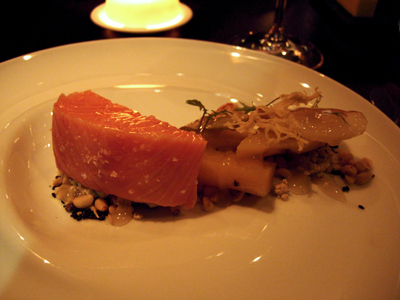 Gelatinously soft salmon, the type you dream of - smoked in-house, it's incredibly moist. It sits on a mix of black sesame seeds, pinenuts and what can best be described as pasty nuggets - these nuggets come in varying sizes and are formed from a mix of pinenuts and clay. Pink fir potatoes, baby fennel and baby onion sit to one side bathed in a light apple puree. 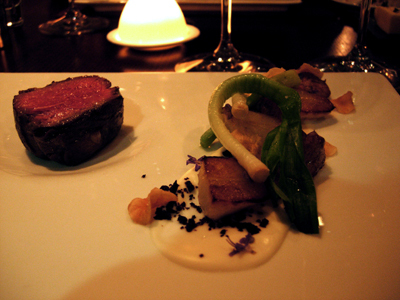 The lamb has a deeply developed flavour and is nicely complimented by the accompaniments. 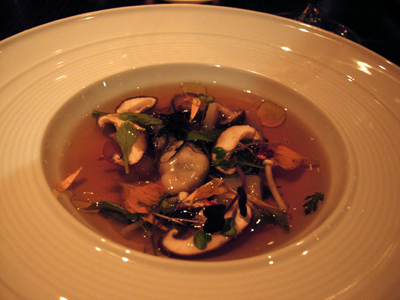 This dish is always enjoyed. 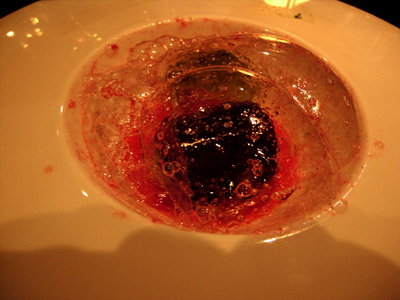 Chocolate mousse sandwiched with turkish delight jelly and topped with turkish delight bubbles and bathed in a rose water scented broth. It's a new dessert for us and although I'm not biggest rosewater fan I actually really enjoyed this, I think the chocolate just combined in a way that really appealed to me. 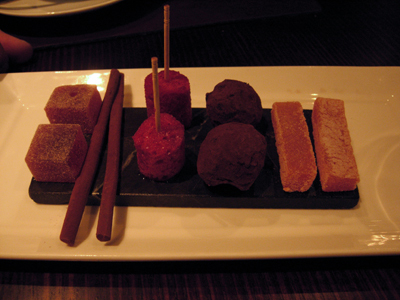 To end the night, petit fours - with a couple of new items to enjoy.